Working with 2 year olds that aren’t talking is the most common thing that I do in early intervention. It takes some experimenting to find a strategy that works to teach communication. One strategy that I try early on is using a picture, an object or a sign/gesture to bridge the gap in communication. Especially for those kids that know what they want to say but they JUST CAN’T GET IT TO COME OUT. 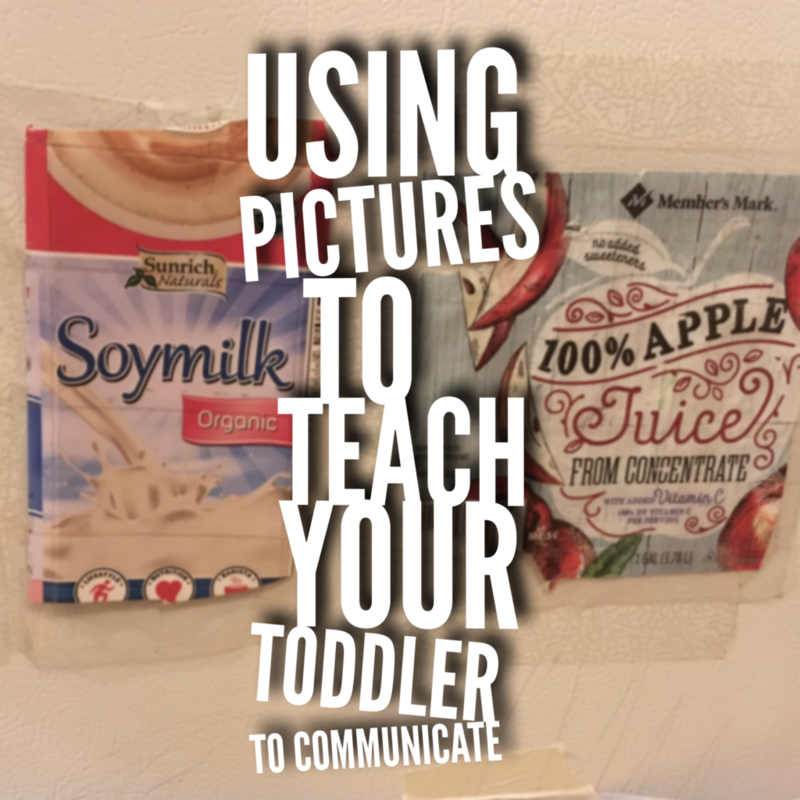 You can use pictures to teach toddlers with language delays to communicate what they want. Parents and teachers should ALWAYS model the spoken word when teaching pictures or signs so that your toddler can hear language as much as possible. Once upon a time, I had a classroom of two-year olds. The primary objective of teaching two year olds is teaching communication, but this was also an inclusive classroom. Two of the eight children had significant communication delays. I was always looking for new ways to improve everyone’s ability to communicate with or without spoken words. One activity I implemented to teach communication through pointing was our music choice picture menu. I made a CD with a mixture of unique songs for creative movement time. I wanted the children to be able to associate pictures with the songs so that they knew what the song choices were. a picture of Pete the cat, they’d get “I Love My White Shoes” song. A ballerina was for Tchaikovsky’s Waltz of the Flowers. There was a picture of a marching band that represented our university’s fight song played by the marching band. I had a picture of a dancing chicken cartoon for the chicken dance. I made the songs and the pictures unique and fun. When I announced, “It’s music time! Who’s ready for music?” they’d run over to the picture menu, which was taped to the wall at their level. When I pointed to the laminated pictures and asked, “Which song should I pick?” Each child would pick songs by pointing or talking or a combination of both. By having these pictures available, I was able to model a variety of words that expanded their vocabulary. I had the opportunity to describe both the picture and the music. Each child had his favorite and knew how to request their song even if they didn’t know how to say it, which was teaching communication in a different way. They were highly motivated to use pointing to communicate because they wanted to play their song and dance! I’ve mentioned before that my husband and I are therapeutic foster parents. In my home with our non verbal 2-year old, I used images to teach him how to communicate what he wanted to drink. To keep pictures as easy and as cheap and as real as possible, I used the milk container cardboard and the juice wrapper from the gallon. I taped them to the fridge using packing tape as a laminate. When little man brought me his empty sippy cup, I pretended I didn’t know what he wanted. When he dragged me to the fridge, I pointed to the milk and the juice pictures and ask him “Do you want milk? Or Juice?” This went on for MONTHS. He hated when I did it. It really made him mad at first, but I kept doing it. One day when we did this, he pointed to the juice and said “ju” and I asked again switching the order and he point to the picture and said “ju” I did a happy dance! This came out of the blue. I had started to lose hope that he was going to ever point or talk. He did both the same day! He had the ability to communicate by pointing! Other examples of using pictures to enhance communication and learning include The PECS program. With PECS, children can be taught to use picture cards to make requests. Offering pictures for children to communicate is a great way to meet children where they are in their language development and help them make choices. It can enhance their receptive vocabulary, their listening skills and their symbolic thinking. You can invest in very expensive tools or it doesn’t have to cost much at all. Your site is so beautiful. I am definitely going to hang out here for the benefit of my toddler and Pre-schooler. Another perspective is always welcome.